Abiraterone is a CYP3A4 substrate and hence should not be administered in patients concurrently on strong CYP3A4 inhibitors or inducers. Likewise it inhibits CYP1A2, CYP2C9 and CYP3A4 and hence should not be given to patients concurrently being treated with substrates of any of these enzymes that have a narrow therapeutic index. Abiraterone inhibits 17 α-hydroxylase/C17,20 lyase (CYP17A1), an enzyme which is expressed in testicular, adrenal, and prostatic tumor tissues. CYP17 catalyzes two sequential reactions: (a) the conversion of pregnenolone and progesterone to their 17-α-hydroxy derivatives by its 17 α-hydroxylase activity, and (b) the subsequent formation of dehydroepiandrosterone (DHEA) and androstenedione, respectively, by its C17,20 lyase activity. DHEA and androstenedione are androgens and precursors of testosterone. Inhibition of CYP17 activity by abiraterone thus decreases circulating levels of testosterone. After oral administration, abiraterone acetate, the prodrug form present in the commercial preparation, is converted into the active form, abiraterone; this conversion is likely to be esterase-mediated and not CYP-mediated. Administration with food increases absorption of the drug and thus has the potential to result in increased and highly variable exposures; the drug should be consumed on an empty stomach at least one hour before or two hours after food. The drug is highly protein bound (>99%), and is metabolised in the liver by CYP3A4 and SULT2A1 to inactive metabolites. The drug is excreted by feces (~88%) and urine (~5%) with a terminal half life of 12 ± 5 hours. In the early 1990s, Mike Jarman, Elaine Barrie and Gerry Potter of the Cancer Research UK Centre for Cancer Therapeutics within the Institute of Cancer Research in London set out to develop drug treatments for prostate cancer. Starting from the drug ketoconazole, they developed abiraterone as a more effective variant, filing a patent in 1993 and publishing the first paper describing the drug the following year. Rights for commercialisation of the drug were assigned to BTG plc, a UK-based specialist healthcare company. BTG then licenced the product to Cougar Biotechnology which began development of the commercial product. In 2009, Cougar was acquired by Johnson & Johnson which developed and sells the commercial product, and is conducting ongoing clinical trials to expand its clinical uses. In the UK, despite being licensed by the European Medicines Agency, the drug is not currently available for routine use on the NHS. In February 2012, the National Institute for Health and Clinical Excellence (NICE) issued preliminary guidance that the drug will not be made available on cost-effectiveness grounds, but this decision is open to consultation. The decision was reversed in May 2012. A phase III trial in subjects previously treated with docetaxel started in 2008. A placebo-controlled randomised phase III clinical trial in patients with castration-refractory prostate cancer who are chemotherapy-naive opened to accrual in April 2009. In September 2010, an independent panel found that the interim results of the phase III clinical trial in previously treated docetaxel patients were so successful that it would have been unethical to keep half the trial participants on placebo, and all patients began receiving the drug. Overall survival was increased by 3.9 months according to this trial (14.8 months versus 10.9 months for placebo). It was approved by the FDA in April 2011. The first clinical studies were run in 2004. A more recent study in patients who had not received chemotherapy reported in 2007 that abiraterone acetate induced decline in prostate specific antigen (PSA) in up to 70% of patients as well as radiological shrinkage of tumors, symptom improvement, normalisation of lactate dehydrogenase. However others cautioned in 2008 that it was too early to know whether abiraterone treatment will have long term benefit. Results of two phase II trials indicate that abiraterone may reduce prostate specific antigen (PSA) levels, as well as shrink tumors. Many of the 21 men in the Phase II trial reported significant improvements in their quality of life and several were able to stop taking morphine, used to control the pain caused after the cancer spread into their bones. On average, progression-free survival (PFS) was prolonged by 161 days in patients which had been treated with chemotherapy, and by 236 days in chemotherapy naive patients. Phase II clinical trials of abiraterone's effectiveness in patients who have not yet received treatment with chemotherapy (33 patients) found a median time to PSA progression of 48 weeks. Another phase II trial in patients who had failed prior treatment with docetaxel (47 patients) showed a median time to PSA progression of 24 weeks. A phase I/II clinical trial evaluating abiraterone acetate in advanced breast cancer patients is also underway. The results of a small study showed that abiraterone eliminated or nearly eliminated tumors in about one-third of men whose disease had not yet spread beyond the prostate gland but was considered likely to do so. A double-blind phase III randomised controlled trial investigated the use of abiraterone acetate in men with metastatic castration-resistant prostate cancer with no previous chemotherapy. They randomly assigned 1,088 patients to receive abiraterone acetate (1000 mg) plus prednisone (5 mg twice daily) or placebo plus prednisone. The median radiographic progression-free survival was 16.5 months with abiraterone–prednisone and 8.3 months with prednisone alone (hazard ratio (HR) = 0.53; 95% confidence interval (CI), 0.45 to 0.62; P<0.001). After a median follow-up period of 22.2 months, overall survival was improved with abiraterone–prednisone (median not reached, vs. 27.2 months for prednisone alone; HR = 0.75; 95% CI, 0.61 to 0.93; P=0.01). ^ "FDA approves Zytiga for late-stage prostate cancer" (Press release). ^ a b c "Zytiga : EPAR - Product Information" (PDF). European Medicines Agency. Janssen-Cilag International N.V. 29 October 2013. Retrieved 24 January 2014. ^ a b c "Zytiga 250 mg tablets - Summary of Product Characteristics". electronic Medicines Compendium. Janssen-Cilag Ltd. 21 January 2014. Retrieved 24 January 2014. ^ a b c "ZYTIGA® abiraterone acetate PRODUCT INFORMATION" (PDF). TGA eBusiness Services. JANSSEN-CILAG Pty Ltd. 1 March 2012. Retrieved 24 January 2014. ^ a b c d "Zytiga (abiraterone) dosing, indications, interactions, adverse effects, and more". Medscape Reference. WebMD. Retrieved 24 January 2014. ^ Attard G, Belldegrun AS, de Bono JS (December 2005). "Selective blockade of androgenic steroid synthesis by novel lyase inhibitors as a therapeutic strategy for treating metastatic prostate cancer". BJU Int. 96 (9): 1241–6. ^ "Zytiga prescribing information" (pdf). Janssen Biotech. May 2012. Retrieved 2012-05-19. ^ Scowcroft H (2011-09-21). 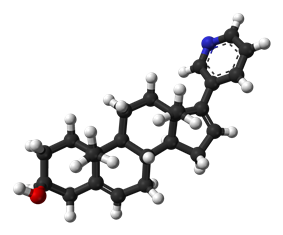 "Where did abiraterone come from?". Cancer Research UK. Retrieved 2011-09-28. ^ "Abiraterone Acetate (CB7630)". Cougar Biotechnology. Archived from the original on 7 September 2008. Retrieved 2008-08-20. ^ "Johnson & Johnson Announces Definitive Agreement to Acquire Cougar Biotechnology, Inc." (Press release). Cougar Biotechnology. 2009-05-11. Archived from the original on 29 May 2009. Retrieved 2009-06-03. ^ "NICE consults on a new treatment for prostate cancer" (Press release). United Kingdom National Institute for Health and Clinical Excellence. 2012-02-02. Retrieved 2012-02-02. ^ Scowcroft H (2012-02-02). "Why today's prostate drug decision makes no sense". Cancer Research UK - Science Update blog. Retrieved 2012-02-02. ^ "Prostate cancer (metastatic, castration resistant) - abiraterone (following cytoxic therapy): final appraisal determination guidance". NICE guidance. 15 May 2012. ^ "'"Prostate drug abiraterone 'set for NHS use. BBC News. 2012-05-16. ^ Bates, Claire (2012-05-15). "England benefits from NHS postcode lottery at long last - as prostate cancer wonder drug looks set for approval south of border but not in Scotland". Daily Mail (London). ^ "Prostate cancer: health watchdog reverses NHS guidance on drug". The Guardian (London). 2012-05-16. ^ "'"Nice 'to reverse ban on prostate cancer drug. The Daily Telegraph (London). 2012-05-14. ^ a b "BTG and Ortho Biotech's Prostate Cancer Trial Unblinded". Genetic Engineering & Biotechnology News. 2010-09-10. Retrieved 2011-05-26. ^ "FDA Approval for Abiraterone Acetate". ^ O'Donnell A, Judson I, Dowsett M, Raynaud F, Dearnaley D, Mason M, Harland S, Robbins A, Halbert G, Nutley B, Jarman M (June 2004). "Hormonal impact of the 17alpha-hydroxylase/C(17,20)-lyase inhibitor abiraterone acetate (CB7630) in patients with prostate cancer". Br. J. Cancer 90 (12): 2317–25. ^ Attard G, Reid AHM, Yap TA, Raynaud F, Dowsett M, Settatree S, Barrett M, Parker C, Martins V, Folkerd E, Clark J, Cooper CS, Kaye SB, Dearnaley D, Lee G, de Bono JS (2008). "Phase I Clinical Trial of a Selective Inhibitor of CYP17, Abiraterone Acetate, Confirms That Castration-Resistant Prostate Cancer Commonly Remains Hormone Driven". Journal of Clinical Oncology 26 (28): 4563–71. ^ Cole A (2008). "Cancer expert doubts claims about prostate cancer trial". BMJ 337: a979. ^ Attard G, Reid AH, Dearnaley D, De Bono JS (2008). "New prostate cancer drug: Prostate cancer's day in the sun". BMJ 337: a1249. ^ "Hormone inhibitor promising for hard-to-treat prostate cancer" (Press release). European Society for Medical Oncology. 2007-07-08. Archived from the original on 13 June 2008. Retrieved 2008-07-22. ^ Warry, Richard (2008-07-21). "Drug for deadly prostate cancer". BBC News Online. Archived from the original on 30 August 2008. Retrieved 2008-08-20. ^ Ang, J. E.; Olmos, D.; De Bono, J. S. D. (March 2009). "CYP17 blockade by abiraterone: further evidence for frequent continued hormone-dependence in castration-resistant prostate cancer". Br. J. Cancer 100 (5): 671–675. ^ "Latest cancer research Phase II results demonstrate efficacy of abiraterone acetate plus prednisone for castration-resistant prostate cancer". ecancermedicalscience. 2010-92-17. Retrieved 2011-05-26. ^ Andrew Pollack (17 May 2012). "Trial Supports Earlier Use of a Prostate Cancer Drug". The New York Times. A new drug used to treat advanced prostate cancer may also help men if used early in the course of the disease, before an operation, researchers reported Wednesday. In a small clinical trial, six months of treatment with the drug, Johnson & Johnson's Zytiga, added to standard therapy, eliminated or nearly eliminated tumors in about one-third of men whose disease had not yet spread beyond the prostate gland but was considered likely to do so. ^ Jennifer Corbett Dooren; Peter Loftus (16 May 2012). "Study: J&J's Zytiga Can Eliminate Some Prostate Tumors". ^ "ZYTIGA (abiraterone acetate) Data to be Presented at 2012 American Society of Clinical Oncology (ASCO) Annual Meeting" (Press release). Janssen Research & Development. 18 May 2012. ^ Ryan CJ, Smith MR, de Bono JS, Molina A, Logothetis CJ, de Souza P, Fizazi K, Mainwaring P, Piulats JM, Ng S, Carles J, Mulders PF, Basch E, Small EJ, Saad F, Schrijvers D, Van Poppel H, Mukherjee SD, Suttmann H, Gerritsen WR, Flaig TW, George DJ, Yu EY, Efstathiou E, Pantuck A, Winquist E, Higano CS, Taplin ME, Park Y, Kheoh T, Griffin T, Scher HI, Rathkopf DE (December 2012). "Abiraterone in Metastatic Prostate Cancer without Previous Chemotherapy". N. Engl. J. Med. 368 (2): 138–48. "Full Prescribing Information". May 2014. "Zytiga (abiraterone acetate) tablet". U.S. Daily Med. "Patient Information". Janssen Biotech. May 2012. "Full Product Information". Janssen Biotech. April 2012. "Prescribing Information". Janssen Biotech. May 2012.